It is an improved version of the split-cycle engine. It has two cylinder compression cylinder and power cylinder. The compression cylinder took air from the inlet and compressed it, while the power cylinder performs combustion and exhaust. I.e air compressor on one side and a combustion chamber at the other end. These two cylinders are connected through crossover passage. Scuderi split-cycle engine able to produce one power stroke per revolution of crankshafts just like a two-stroke engine. The unique design of the Scuderi engine solves the problem with the previous model of split-cycle engine. The high compression ratio can be achieved – because the compression cylinder and power cylinder are independent. Reduce CO2 emission by 50%. Increase fuel efficiency up to 50 %. High torque and power with greater efficiency. Cold air never enters into power cylinder results in the quick temperature rise. A cooling method is required at crossover passage or at the cylinder wall. High temperature may cause breakdown of lubricating oil. 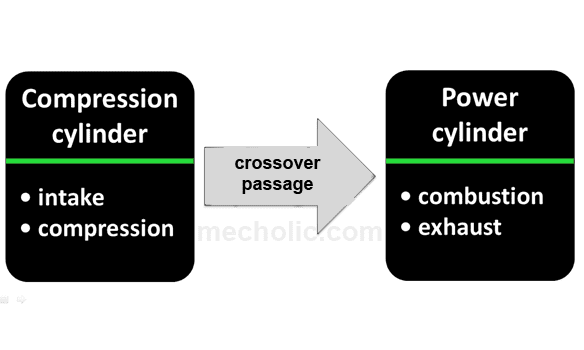 The crossover passage experiences high acceleration. The valve's durability depends on it.